Concrete sealers are much more than just a nice aesthetic finish to a job. They make your concrete more resistant to the natural elements, stains from grease or oil and any scuffs and scratches. Choosing the right one for the right project isn’t always clear, there are pros and cons to each type of concrete sealer and each one of them lends itself to specific jobs. The balance is always between how well a sealer performs functionally and how it looks. So you can tick both those boxes, you’ll need to understand the main types, and how well they work on different jobs. Due to how easy it is to use and its versatility, solvent based acrylics are the most popular concrete sealer on the market by a long way. It’s known for how well it brings out colour and is commonly used on a range of surfaces from driveways to countertops. The chemistry is an acrylic emulsion (fancy word for plastic) that’s dissolved in a solvent, acetone or a combination of them. Once the sealer is applied it dissolves and leaves behind an acrylic coat. That coat will enrich the colour of the concrete and leave a layer of protection on the surface. Solvent based acrylics can be rolled on with a lint free roller or even sprayed using a paint or hand pump sprayer. This stuff is highly flammable, so anything that could ignite needs to be turned off and controlled. This type of sealer might require some maintenance. If you’re using it for an inside job then a wax or floor finish can be appropriate, otherwise just applying a coat of the same material will keep your concrete resistant and aesthetically pleasing. Because of the water base, this sealer has a fainter smell, is more environmentally friendly and gives off a more natural look than some of the other sealers. It’s much easier to handle than a solvent based acrylic in terms of safety and risk, making them a good alternative for an indoor sealer. You can apply it with a sprayer or a roller and don’t panic if things don’t look right at first, it can appear white or blue when wet but it’ll dry crystal clear. Because of a tendency to need more maintenance, it’s better for residential use where the wear and tear isn’t as bad as in a commercial setting. This product has to be mixed before it’s applied and comes in a few different ratios. Epoxies tend to have high durability and are extremely resistant to scuffs, cuts and scratches. Even though this sealer has a very nice finish too it, they can also be used as the first coat underneath a polyurethane or even another expoxy. This is more of a coating than a concrete sealer, it works by creating a chemical barrier that sits between the surface of the concrete and the outside world. Essentially it acts as a big, permanent layer of plastic on top of your concrete, it can be manipulated and applied as a very thick layer. The thicker it is applied the longer it lasts and the more durable it is. If you’re after the product that’s the most abrasion resistant then polyurethane is your best bet. Because it won’t scratch, it’s ideal for commercial jobs with heavy traffic. You can get it in a water based form or a solvent based form but the rule still applies that a solvent based composition will give you a stronger seal than a water base. If you’re going with polyurethane it’s usually because you want something highly resistant to damage, sticking to a solvent base is more likely to help you achieve that. Now that we’ve gone through the most popular types of concrete sealer, here’s a few tips to keep in mind before you apply. Make sure any stains on the concrete are cleaned off, stains and oil can prevent the sealer from adhering. Try to avoid crossing your brands, most manufacturers will advise you to completely remove one brand of sealer before applying theirs, the best way around this is to find a good brand and stick to it. Waiting around 30 days after the new concrete has been completed is usually enough time to let things settle and cure. 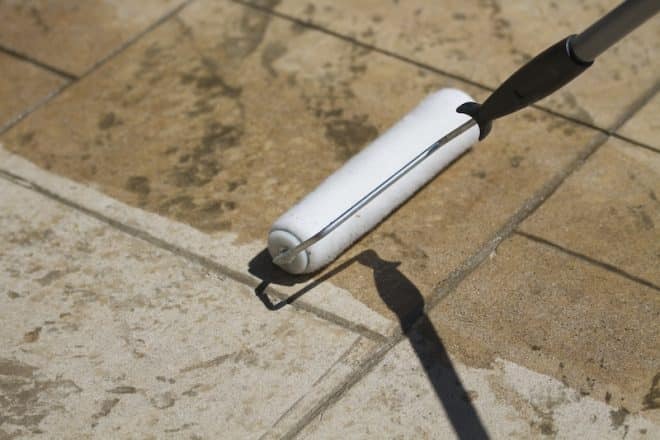 Dry conditions are the best for applying sealer and remember to make sure that your sealer is dry before the concreted area is used – whether it’s foot-traffic or elbows on countertops. Applying some concrete sealers will leave you open to a range of harmful chemicals. Safety gear like goggles, gloves and clothing that covers your skin should be worn. It’s also important to minimise fume inhalation, particularly when you aren’t working with water-based sealer. When it comes to concrete there’s a lot of thought that goes into sealing the deal, make sure you consider all your options before sealing your concrete so you can get a strong, beautiful finish. And, if all that sounds like too much hard work, why not give the experts at Everlast Services a call?